One of the most compact USB MIDI keyboards is a Novation Launchkey Mini with 25 velocity-sensitive keys, 16 velocity-sensitive drumpads with color backlight, 8 knobs and other controllers. It also has : 2 octaves control buttons, 2 tracks selectors, 2 navigation buttons, InControl activation switch and 2 round buttons with color backlight. In addition to them there are Kensington Lock slot and USB port for connection to computer and powering are placed on keyboard. 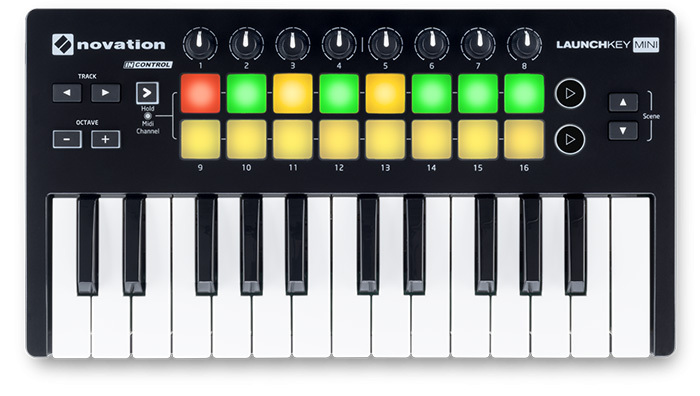 With Novation Launchkey Mini DAW Ableton Live Lite 9 and program Novation Launchpad are supplied; it can be connected to Apple iPhone and iPad devices via Camera Connection Kit or USB Camera Adapter. MIDI keyboard is powered only from USB port; and can work in Windows XP, Vista, 7, 8, 8.1 and 10 and Mac OS X and integrate with modern DAWs : Avid Pro Tools, Ableton Live, Steinberg Cubase, FL Studio, Cackewalk Sonar, REAPER and others, and their VST/AU instruments and effects. Its sizes are 325 ( width ) x 175 ( depth ) x 43 ( height ) mm. Package with Novation Launchkey Mini contains : USB cable, disks with drivers and programs, warranty card and user’s guide. MIDI keyboard is very compact and at the same time has large amount of controls, which not many larger MIDI keyboards have. But it has its own minuses : it has no modulation control and pitch bend wheels; it is powered only from USB port and has no power adapter input, so it will draw charge from tablet PCs and notebooks batteries; also 25 keys can become not enough for professional work over time. 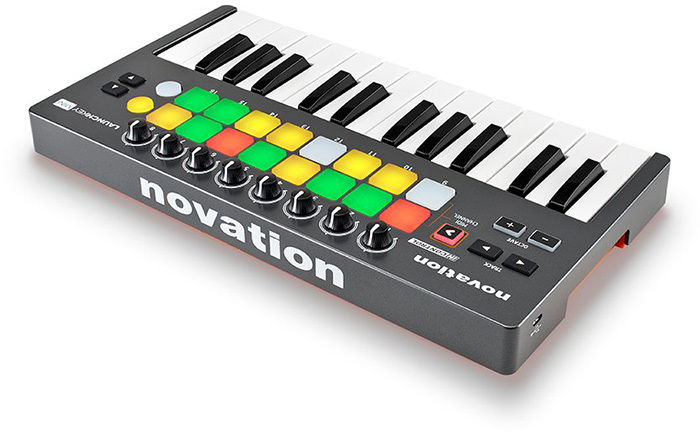 However, in the role of compact and mobile device Novation Launchkey Mini can be very good, especially if its price in shops is lower than of similar competitors.